The Fairmount Automation Controller Series, Model 2100 (FAC-2100) is a general-purpose, highly configurable, multi-loop process controller. Its aluminum-steel construction makes the controller extremely rugged—it is specifically designed for operation in environments susceptible to extreme temperature, humidity, pollution, corrosion, shock, and/or vibration. To install the MIL-STD-901D Grade A shock qualified device, simply cut out the specified pattern in your console or panel and bolt the controller in — no special shock/vibration mounts, supports, or brackets are required. 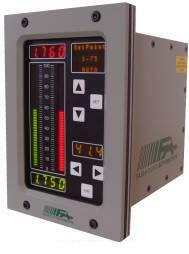 The FAC-2100 digital process controller is equipped with a wide array of I/O capabilities. It combines the analog functionality of a standard process controller, with the digital functionality normally associated with Programmable Logic Controllers (PLC). In its standard configuration, the FAC-2100 has three analog inputs, two analog outputs, two universal digital inputs, eight standard digital inputs, two digital outputs, and four form-C relays. Additional I/O can be added to the device through remote I/O points from our Chameleon product line. FAC-2100 controllers are configured with the Design Pad G4 graphical programming environment. Design Pad technology makes setting up, debugging, and fine-tuning your control scheme quick and easy. It also allows the device to be very versatile — virtually every feature from the front-panel displays to the back-panel I/O and everything in between can be customized to fit your needs. The user interface on the front panel of the FAC-2100 provides 2 bar graphs, 3 numeric displays, and 3 lines of scrolling alpha/numeric text. It allows users instant access to the application-specific parameter values that were tagged as operator-adjustable in the controller’s program. With the ‘Set Menu’ (the upper three keys) the user can easily change parameter values, tune a system, turn outputs on or off, etc. The ‘Automatic/Manual (A/M) Menu’ (the three lower keys) allows an operator to quickly change and manipulate the A/M state of one or more control loops. The FAC-2100 also supports various industrial networking protocols via RS-485 and/or RS-232 communication ports. Supported protocols include FairNET, Modbus ASCII (master and slave), Modbus RTU (master and slave), Custom ASCII, or Custom Binary protocols. FairNET provides both deterministic and non-deterministic messaging, automatic bus mediation, and a robust master-slave architecture.